Lake Manyara National Park is one of the most scenic parks in Tanzania. Patches of yellow fever trees are dotted around the grassy lake shores and the rift valley wall is a prominent feature throughout the park. The entrance of the park is in a very special environment: a ground water forest. There are always lots of monkeys and baboons around, but don’t forget to look up higher in the trees as the silvery-cheeked hornbills like this habitat as well. There are always lots of elephants around and you might be lucky to spot some of the famous tree-climbing lions. Unfortunately, the road that used to run close to the shore has been closed for the last few years and might not be re-opened. So seeing the flamingoes isn’t that easy anymore unless you head out by canoe, one of the activities on offer. Because of the proximity to Arusha, most visitors limit their visit to an afternoon on the way through to Ngorongoro. I’ve found the park almost devoid of tourists in the morning and if you have time, a 2-night stop is certainly not excessive. Lake Manyara is an unassuming yet attractive park that in truth deserves more time and attention - most people dash through en route to Ngorongoro Crater. Two-thirds of it is taken up by the lake itself and the rest is squeezed between the lake shores and the red cliffs of the Manyara Escarpment of the Great Rift Valley. As such, its varied habitat attracts myriad birdlife and the lake becomes a blanket of pink when thousands of flamingoes descend upon it on their migration. It’s well-known for its huge population of baboons – they seem to be everywhere here. But it’s perhaps better known for its far smaller numbers of tree-climbing lion, a rare but beautiful sight. 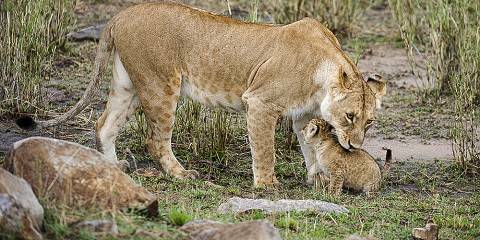 I saw a lioness and three young cubs perched quite precariously in an acacia tree on my last visit and would have stayed to watch them for hours were it not for the tsetse flies that can make life quite uncomfortable. 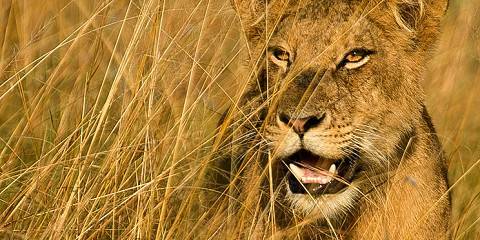 One school of thought is that the lions climb the trees to avoid the flies! Manyara is small, scenic and mostly covered by the large, shallow Lake Manyara. Despite this, the park is notable for its great diversity of habitats, and for its remarkably high biomass density of large animals. Hippos, elephants, zebras, giraffes and buffalos are all frequently spotted, and with luck, you may see one of the tree-climbing lions for which Manyara is famed. Manyara is also one of the few parks where you can do night drives. Among the things I like best about the greater Manyara area are the wonderful views down over the lake from the top of the escarpment. Many northern circuit safari itineraries relegate Manyara to a quick day visit. If your time is limited, this may be 'enough' in favour of additional time in the more action-packed Serengeti or Ngorongoro Crater. However, if you are a repeat safari-goer, or if you are interested in birding (for which Manyara is wonderful), then plan on at least a night or two here. The dramatic setting of Lake Manyara was once extolled by Ernest Hemingway as “the loveliest that I had seen in Africa” and it is difficult to take issue with this bold assertion. The lake, a fluctuating alkaline body set within a shallow sump, is hemmed in by the 600m-high golden-brown Rift Valley escarpment, and is also overlooked by a scattering of extinct volcanoes that rise in splendid isolation from the open plains of the Maasai Steppes. With habitats ranging from lush groundwater forest and open water to acacia woodland and open grassy floodplains, Manyara offers a microcosmic introduction to the habitats and wildlife of northern Tanzania. In my experience, it also provides a perfect introduction to the country’s stunning birdlife, with a good possibility of ticking 100 species in one day, including several birds of prey, massive forest hornbills, large flocks of pink flamingos and flotillas of pelicans. Mammalian highlights include the legendary tree-climbing lions of Manyara, which frequently ascend into the canopy of acacias (though these days you are as likely to see them in arboreal action in the Seronera area of Serengeti) along with the unusually large-tusked and relaxed elephants, and the hundred-strong baboon troops that lounge alongside the road through the groundwater forest. A reliable hippo pool can now be viewed from a stilted wooden platform reached via a road through an area of marsh that offers superb conditions for aquatic bird photography, using your car as a hide. This park had occupied a romantic corner of my imagination ever since childhood, when I read about Ian Douglas-Hamilton’s pioneering work with elephants during the 1960s. When I finally got there for myself I found it every bit as beautiful as I’d envisaged, with lush forest carpeting the rugged walls of the Rift Valley escarpment, and the shimmering waters of the lake crammed with water birds. However, there was no escaping the crowds. The park is small, and attracts a high concentration of day visitors passing through en route to the greater attractions of the Serengeti. Many of these visitors don’t have time to venture far into the park so cluster along the near lakeshore, which can mean an unseemly build-up of traffic in this area. It’s a shame, because time to explore deeper into the park would, I’m sure, be rewarding. I saw the famous elephants, of which there were plenty, plus enormous numbers of baboons, and forest species such as bushbuck and colobus monkeys. The lake was impressive, with plentiful hippos and waterbirds – including flamingos. Like most day visitors, I missed the famous tree-climbing lions, which generally require more time and a trip deeper into the park. A stay inside the park would also allow canoeing and night drives, which are both excellent options. It’s a lovely destination, and rich in wildlife, but suffers from its position as gateway to the ‘Northern Circuit’, which means that for many visitors it will always serves as an introduction to – and subsequently poor comparison with – the Serengeti. We drove through Lake Manyara National Park en-route to Ngorongoro and Serengeti and it was pretty much our first initiation to Tanzanian parks. The views are spectacular (as is to be expected in this part of Tanzania) and as a warm-up to Ngorongoro Lake Manyara is perfect. The lions eluded us (although there were plenty in the crater) but the lake, with its great pink-tinged acres of flamingos is an unforgettable sight in itself. Hemingway called it ‘the loveliest lake in all Africa.’ I wouldn’t want to argue with him. This thin sliver of a park is often bypassed in the rush between Tarangire and Ngorongoro and the Serengeti, but that would be a mistake. For a start, the dramatic escarpment that forms the western wall of the Great Rift Valley makes this one of the easiest places in East Africa to get a sense of the drama of the great gash that slices through the heart of the continent. And then there’s the promise of tree-climbing lions – these lions defy nature and, unlike other parks where lions take to the trees, have done so since before tourists began arriving here. Elephants, buffalos and blue monkeys are other highlights. And Lake Manyara has another very special reason to visit – this is one of few East African parks where night drives and walking safaris are both possible (though not at the same time). And if, like me, you’ve read and reread Peter Matthiessen’s The Tree Where Man Was Born, you’ll recognise that some of his most famous scenes come from Lake Manyara. Lake Manyara is a small and very picturesque park that is largely overshadowed by the neighbouring Ngorongoro Conservation Area. On safari in Tanzania in the early 1930s, Nobel laureate Ernest Hemingway said that Lake Manyara , which takes up most of the national park, was the “loveliest” in Africa. Many might still agree today. Hugged by the green and densely-forested Manyara Escarpment of the Great Rift Valley, the mirror-like surface of the shallow lake is covered in a thick blanket of pink flamingoes. Manyara has also become known for its leopards and tree-climbing lions, though I had no luck with either and was told by my guide that both were very rare sightings here. 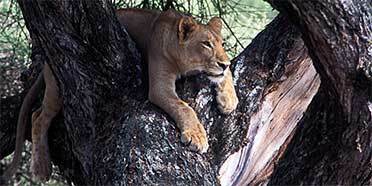 I was also informed that in fact lions have been seen climbing and lounging about in trees in many of Tanzania’s parks. Easier to spot were the large numbers of baboons, elephants and hippos. Sadly the small size of the park and its proximity to the two biggest stalwarts on the Northern Circuit mean that Manyara can get rather busy. But it’s still worth at least a morning’s game drive and a few landscape pictures. The namesake lake covers a third of the park and during the rainy season it hosts millions of flamingos. During the dry season the lake withers down to nearly nothing and I found the shimmering salt flats left behind to be eerily beautiful. Even more spectacular is the Rift Valley escarpment which soars along the park’s western border providing stunning views from above and a dramatic backdrop from down below. As for the wildlife, Lake Manyara is second tier compared to other parks in the area, but it’s still good enough to deserve a day on any Northern Circuit safari, and your visit will be especially enjoyable if you take enough time to get beyond the busy northern end of the park. The stars are the tree-climbing lions, which while very hard to find, are more likely to be seen here than in any other park in Tanzania. The leopards are equally hard to spot. Elephants, buffalos, hippos, zebras, and giraffes, however, are abundant, and the diversity of habitats (there are 11 different ecosystems within its 648 square kilometer borders) makes it one of the best bird-watching parks in Tanzania. The best thing about the park is the variety of activities available. Night drives, bush walks, and canoe safaris (lake levels permitting) give the typical safari itinerary a little variety. Lake Manyara is easily seen from the road that climbs up the Rift Valley, where all safari vehicles stop for a gawk at the pink flamingos, but what I like about this park is its simplicity for a game drive. There’s essentially one track through the permanent oasis of lush greenery, with the algae-streaked lake on one side and impressive baobab-strewn cliffs on the other. Despite looking for a tail dangling down through the branches, I never seen Manyara’s famous tree-climbing lions (a rare sight), and have had better luck with cats on the short plains of the other parks. But I’ve seen numerous plains game, elephant among the giant acacia and fig trees, pods of hippo in the Simba River, and pelicans, storks, geese, herons and cormorants, which share the lake with the flamingos. It’s a perfect accompaniment on a longer safari to the Ngorongoro Crater and Serengeti. Lake Manyara National Park is an ideal stop en route to/from Ngorongoro and the Serengeti. The park may be small in comparison to its northern counterparts, but it’s excellent for birdwatching and a good area to find elephants. What’s more, the scenic park is also renowned for its potential to see its legendary tree-climbing lions. While sightings are not always common, on my last visit I was treated the spectacle of three young lion cubs playfully fighting with each other for the best position in the crook of an acacia branch. The park’s horseshoe-shaped driving route takes you through a heavily wooded forest and then wends its way between the banks of the lake - described by Ernest Hemingway as the "loveliest [lake] I had seen in Africa" - and the impressive rise of the Great Rift escarpment. Elephant, giraffe, buffalo and wildebeest can often be found gazing in these flood plains. Over the years I’ve found it’s best to visit the park in the morning as it is pleasantly quiet with most tourist groups choosing to stop via the park in the later afternoon on their return to Arusha. Lake Manyara National Park is dominated by the lake, which engulfs a whopping 65% of the total park area when full. However, its water levels fluctuate wildly between the seasons with the lake all but disappearing at the height of the dry season. Most of the terrestrial sector of the park is sandwiched into a narrow strip of land between the lakeshore in the east and rift valley escarpment to the west. As a consequence of its small size, limited land area and proximity to Arusha, there are few game-viewing tracks and the park has a reputation for getting quite crowded during the safari season. So pick your time to visit carefully and try to avoid the peak tourist months of July and August. The highlight attraction for most visitors is the shallow alkaline lake, which – when filled by the seasonal rains (December to May) – becomes obscured by a pink carpet of feeding flamingos. With the rift valley escarpment providing a beautiful backdrop, enjoying an early morning coffee or late afternoon sundowners on the lakeshore – with hundreds of thousands of flamingos for company – is certainly one of the quintessential African safari experiences and not something you’ll forget in a hurry. The migratory flamingos are just one of over 300 bird species that frequent Lake Manyara and its varied habitats. But non-twitchers will probably place more emphasis on the park having four of the Big Five (no rhino), although you need some luck to spot a lazy leopard or lion lounging on the boughs of a big fig or mahogany tree. For those who are allergic to crowds, it’s worth noting that Chem Chem lodge – located within the Kwakuchinja wildlife corridor linked to Tarangire – and AWF’s neighbouring Manyara Ranch conservancy (where lesser kudu is a notable wildlife sighting) are great safari options if you have the budget to afford this more exclusive safari experience. Lake Manyara’s geography is very different from Tanzania’s other parks – it’s long and thin, sandwiched between the lake itself and the high cliffs of the Rift Valley. In my opinion, it’s a bit underrated, and often overlooked in favour of the more glamorous Ngorongoro Crater and Serengeti. Manyara’s two best features are the appealingly ‘Lost World’ feeling of the towering cliffs and wheeling flocks of birds, and the beauty of the lake. Game drive vehicles are allowed right down to the water’s edge, where you’re bound to see buffalo grazing in the emerald green swamp grass, and in season, impressively large flocks of flamingos and pelicans on the lake. 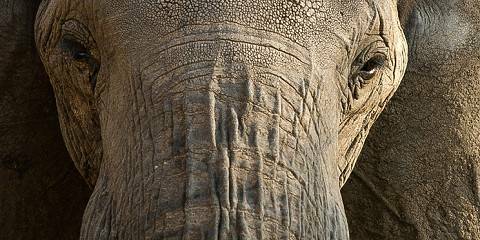 I also love Manyara’s abundance of elephants, which were studied intensively by famous biologist Ian Douglas-Hamilton in the 1970s. As a result, they’re well accustomed to human visitors and tolerate close approaches by people. The classic book ‘Among the Elephants’ by Douglas-Hamilton is one of my favourites, and essential reading if you want to get the most out of your visit. Manyara is also famous for tree-climbing lions, but be warned - lions can be frustratingly hard to find here either in or out of the trees, especially if you just come in for one or two days. On my last visit, though, a night drive yielded no less than THREE leopard sightings, which more than made up for the lack of arboreal cats in the daytime.